SÃO PAULO, BRAZIL – Clashes between taxi drivers and Uber drivers on Thursday night in Brazil’s two largest cities, Rio de Janeiro and São Paulo, ended with broken windows and damaged automobiles. In São Paulo, the skirmish occurred outside the Unique Hotel, where a Carnival ball promoted by Vogue Magazine was taking place. Clashes between taxi drivers and motorists using the Uber app have been common in Brazil in the past year, photo by Fernanda Carvalho/Fotos Publicas. According to local news outlets, taxi drivers tried to prevent Uber drivers from picking up passengers at the end of the gala. “The DTP (Public Transport Department) did not send over any one to monitor the situation, so they (taxi drivers) reacted on their own,” Luis Aguiar, director of Simtetaxi (Taxi Drivers Union) was quoted by O Globo as saying. Reports stated that at least two black cars (the most distinguishing characteristic of an Uber transport) were damaged, including one which was passing by the area at the time. The skirmish went on until 3:30 AM, when the police were called. At least one photographer and a traffic agent were wounded by taxi drivers according to military police. 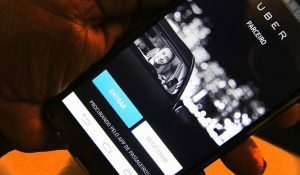 In Rio de Janeiro there were reports of at least two Uber motorists being threatened by approximately twenty taxi drivers while waiting for customers at a gas station near Lagoa Rodrigo de Freitas. One of the Uber motorists told Globo that they tried to take cover in the station’s convenience store while security guards called police. The Uber cars were also reportedly damaged by the taxi drivers. Another motorist driving a black sedan in the area was said to have been mistaken for an Uber driver and had his car damaged by angry taxi drivers. According to the motorist the damage was not worse because he was able to drive away. In September of 2015 Rio de Janeiro was the first city in the country to prohibit Uber services, but the courts overturned the ban in early December. São Paulo’s city council passed a bill at the beginning of 2016 that regulates commercial driving services that operate via apps and the Internet.